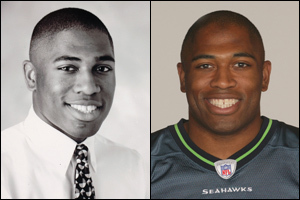 Arguably the greatest running back in Greater Cincinnati history, Shaun Alexander's record-setting high school career set standards that may never be equaled. His senior season for the Boone County Rebels ranks among the best in United State prep football history – rushing for 3,166 yards and scoring 54 touchdowns. In his four-year career, Shaun rushed for 6,662 yards and scored 110 touchdowns. In 15 games as a senior, he averaged 211.3 yards per game and 6.93 yards per carry. Consider this – as a senior, his single season rushing total ranks 25th all-time in the U.S. and No. 2 all-time in Kentucky prep history; his 54 TDs stands as 8th best in the country and No. 2 all-time in Kentucky; his 456 attempts that season ranks No. 3 in the U.S. history and No. 2 in Kentucky; his 326 single-season points is the best in Kentucky prep history and his career touchdowns ranks #3 in Kentucky. Shaun, named LaRosa's Male Athlete of the Year in 1994-95, was runner-up for the Old Spice Prep Athlete of the Year, was named to the Parade Magazine and USA TODAY All-America teams. He was named Kentucky's Mr. Football, was twice named Player of the Year by the Kentucky Post and the Kentucky Enquirer. He was a two-time First Team All-State selection by the Associated Press and the Louisville Courier-Journal. Alexander's accomplishments continued at the University of Alabama where he stands as the Crimson Tide's all-time leading rusher (3,565 yards/4.9 average) in four seasons. He set Alabama records with 727 rushing attempts, fifteen 100-yard games, 41 rushing TDs and 50 total TDs. When he left Alabama, he held 15 school records and three Southeastern Conference records. Currently, Shaun rates as one of the top running backs in the National Football League with the Seattle Seahawks. Going into the 2005 season, Shaun had 5,937 career yards rushing. He was 1 yard shy of tying for the NFL rushing title in 2004. During the 2005 season, he became the first running back in NFL history to score 15 or more touchdowns in five consecutive seasons. Shaun, and his wife, Valerie, live in Seattle, where they have two daughters, Heaven and Trinity. Wyoming High School has a tradition of turning out the complete athlete and Bob Goodridge certainly ranks among the best in the Cowboys' storied history. A four-year letterman in three sports – football, basketball and track – Goodridge was regarded as one of the city's finest athletes during the early 1960s. In basketball, Bob was a First Team All-City and Second Team All-Region selection. He averaged 15.5 points as a senior, including a career-best 32-point game in beating Hamilton Garfield in the 1964 district championship. The Cowboys went 39-4 his final two seasons. It was football, however, where he most excelled. Goodridge was a two-way starter both as a junior (RB-DB) and as a senior (QB-DB). He was a First Team All-Miami Valley Interscholastic League pick both seasons, captain of the MVIL Offensive Team in 1963, a WCPO First Team All-City defense. 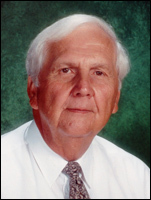 He was named winner of the prestigious "That's My Boy" Award in 1964 – emblematic of the finest student-athlete football player in the region. Wyoming's 1962 and 1963 teams were outstanding – finishing 20-0. The 1962 team not only went undefeated, but also unscored upon (446-0). Goodridge, who returned seven punts and one kickoff for TDs his last two seasons, was the city's fifth leading scorer in 1963. Goodridge, an outstanding track star in high school as well, continued his football career at Vanderbilt University where he starred at wide receiver. In 1967 he became the first player in Southeastern Conference history to gain more than 1,000 yards in receptions, and was named SEC Player of the Year. He also played in the Blue-Gray game and the Senior Bowl. Goodridge still ranks in the Top Ten in Vanderbilt and SEC conference history in at least 10 different categories – No. 1 in Highest Yards Average per game/receiving 111.4 (No. 6 in SEC history), No. 4 and No. 8 in single-game reception yards (201 vs. Navy, 177 vs. William & Mary). His 15 receptions in the Navy game ranks #2 all-time at Vandy and #5 all-time in the SEC. He wound up the 1967 season with 1,114 yards on 79 receptions with six touchdowns. The total yards gained still stands No. 2 all-time at Vanderbilt and the 79 receptions is 7th best in SEC history. Goodridge, a sixth round draft pick in the NFL draft in 1968, played one season with the Minnesota Vikings. Bob was inducted into the Wyoming High School Hall of Fame in 1992. Goodridge has coached football for more than 30 years in the area, including as head coach at four area high schools. Currently teaching and coaching at Northwest High School, Bob Goodridge and his wife Sharyn, have three children, Robyn, Meghyn and Brenyn. One of the finest female divers in Greater Cincinnati sports history, Olympian Becky Ruehl Amann joins Shaun Alexander as rare first-ballot inductees into the Hall of Fame. Becky began competing on the high school level in the 7th grade and went on to win the Kentucky state High School One-Meter Diving Championship five years in a row. Her 491.55 performance as a senior set a state record that stood till 2003. She won the Northern Kentucky Regional diving title six times, including a 502.20 record which still stands. Her high school honors were numerous, including being named Kentucky's "Outstanding Female Athlete of the Year" (1995), Kentucky Post Coaches "Performer of the Year" (1995), the Phillips 66 Performance Award (1995) and the United State Olympic Committee Diver of the Year Award (1995). Ruehl went on to the University of Cincinnati where in 1996 she won the NCAA Championship 10 Meter Platform Diving Title. She also placed second that year in the 3-Meter Diving event and was named NCAA Diver of the Year. Becky, a five-time NCAA All-American, is the only female athlete in UC history to win an NCAA title, and was inducted into the UC Hall of Fame in 2005. Becky holds four National Titles in Women's 10-Meter Platform Diving and earned a bronze medal at the 1995 Pan American Games in Mar Del Plata, Argentina. She became the first athlete from Northern Kentucky to qualify for the Olympics, where she went on to finish fourth in the world in the Women's 10-Meter Platform Diving Event at the 1996 Centennial Olympic Games in Atlanta. 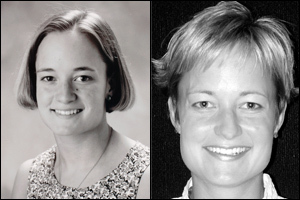 With championship titles in the both the 1-meter and 3-meter events at the National Independent Championships in 1996, she was named NIC Diver of the Year. Twice named GTE Academic All-American, Ruehl was given the Greater Cincinnati/Northern Kentucky Women's Sports Association Wilma Rudolph Courage Award in 2000. Becky Ruehl Amann is currently employed as a graphic designer in Chicago, where she lives with her husband, Brandon. The family name Sollmann and St. Xavier athletics were synonymous throughout much of the 1990s. Older brother Scott set the lofty standards for his brother, Steve, to follow. 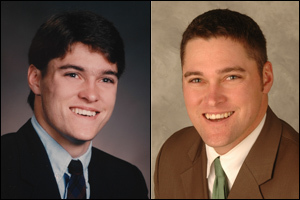 A two-sport star in football and baseball, many of Scott's records still stand at St. Xavier as the speedy athlete went on to star at the collegiate level at the University of Notre Dame and enjoy a five-year career in professional baseball. Sollmann, who earned six varsity letters for the Bombers, established remarkable football statistics his senior season, culminating with being named Ohio's Division I Co-Player of the Year by the Associated Press and being selected Honorable Mention All-America by USA TODAY. As a senior, Scott racked up 2,512 all-purpose yards and scored 34 touchdowns that landed him "That's My Boy" honors by the National Football Foundation. He was also accorded Cincinnati Enquirer and Cincinnati Post Division I Player of the Year honors and First Team All-Ohio. Consider this, his 2,512 all-purpose yards compares to 3,538 total all-purpose yards the Bombers' opponents had in 1992. He wound up with 2,318 yards rushing, 807 yards receiving, 1,794 return yards for 4,919 career all-purpose yards. He holds school single-season records for most points scored (204), most TDs scored (34), most TDs rushing (25) and best rushing average (8.2) and single-game marks for most points scored (36) and most TDs (6). A three-year starter in baseball, Scott was honorable mention all-city as a sophomore and junior. His senior season was dramatically affected by a bout with mononucleosis. At Notre Dame, Scott played as a walk-on in football at wide receiver and punt/kick-off returns. He starred in baseball, being named Freshman All-America and was a three-time First Team All-Big East selection. He set single season records in triples (11) and stolen bases (52). Drafted in the 7th round of the 1996 draft by the Detroit Tigers, Scott played five seasons in the minor leagues. Currently, Scott lives in Cincinnati and is studying to be an attorney. He hopes to pass the bar exams this summer. Hamilton High School has enjoyed a storied basketball tradition, but few players have set as an imposing physical presence as Greg Stokes. In just two short years of varsity basketball (split between Garfield and the merger of with Taft in 1980), Stokes scored almost at will and swatted away shots with intimidating force. Greg wound up with a career 925 points. He set a school record for single-season average (24.4) and blocked shots (148). Stokes was named Ohio's High School Class AAA Player of the Year by both the Associated Press and United Press International and was selected as a Parade Magazine All-American. In 26 games as a senior, Greg scored 635 points, averaged 24.4, had 389 rebounds (14.96 averages), shot 59.7% from the field and had 148 blocked shots. He had his uniform No. 41 retired at the end of his senior season. Greg went on to star at the University of Iowa where he continued his record-setting performance. In four seasons with the Hawkeyes, Stokes had 229 blocked shots (#2 all-time in Iowa history), scored 1,768 points (#3 all-time), had 807 rebounds (sixth all-time), 705 field goals (#2 all-time) in 1,294 attempts (#3 all-time). In 1983, his 20.4 average was best in the NCAA tournament. Stokes still holds Iowa's record for a perfect 11-for-11 scoring performance vs. Georgia State (Dec. 12, 1984). When Greg graduated in 1985, he was Iowa's all-time leader in scoring, blocked shots and in field goals percentage for single game and career. 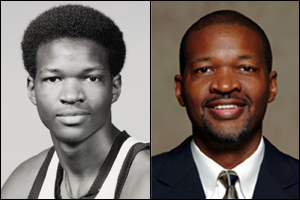 Stokes was named to the Big Ten team three years in a row, and was runner-up for MVP in the conference in 1984-85 (senior year). In 1983, he was a member of the United States gold-medal winning team in the Pan American Games. His uniform No. 41 has also been retired at the University of Iowa. Drafted in the second round by the Philadelphia 76ers, Stokes played two seasons in the NBA, then went on to enjoy an extended career in both Europe and Australia. Greg has been inducted into the Hamilton HS Hall of Fame and the Butler County Hall of Fame. Currently, Greg, who resides in Marion, IA, is a real estate broker and a program director for Kirkwood Community College, where he is assistant men's basketball coach. Greg has two children, Darius and Kiah. Greater Cincinnati has an outstanding tradition in volleyball and volleyball coaches, but Julie Thoman Perry raised the sport and recognition of the region's excellence to another level in building the dynasty that has become St. Ursula volleyball. In 25 seasons, Julie has compiled a staggering 454-171 overall record (.726) and has led the Bulldogs to an amazing eight state championships, including a run of six straight state titles (1993-1998). Her 2003 (and most recent) state champion was regarded as the No. 1 team in the nation in preseason, went undefeated and was named mythical National Champions by Prepvolleyball.com. It wasn't the first national recognition for St. Ursula and Perry as the 1993 team finished No. 25 in the nation by USA TODAY, the 1994 team finished No. 23 by USA TODAY and the 2002 squad was No. 2 in the country by Student Sports.com. Julie's 2003 team became the first volleyball team in Ohio history to win eight state titles and it marked the 25th state championship for the Girls Greater Catholic League. In addition to the state titles (six in Division II and two in Division I), St. Ursula was state runnerup (2002) and state semifinalist (1988). Perry's teams have won eight GGCL titles, 16 sectional championships, 13 district titles and 10 regional titles. Julie's coaching excellence has been duly recognized – being inducted into the National High School Athletic Coaches Association Hall of Fame (June 2004) and being selected National Federation/High School Coaches Association Ohio Coach of the Year (2002). She has been named Cincinnati Enquirer Coach of the Year 10 times, Cincinnati Post Coach of the Year nine times, Southwestern Ohio Volleyball Coaches Association Coach of the Year 10 times. She's received the SWOVBCA Outstanding Achievement Award three times, and is a four-time recipient of the Ohio Career Achievement Award. 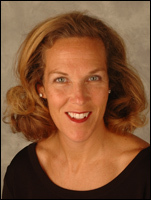 Julie, who starred in volleyball at Northern Kentucky University, has also been inducted into the NKU Hall of Fame (1999) and the St. Ursula Academy Hall of Fame (1999). Julie, and her husband, Timothy, live in Fairfax and have two children, Jim (10) and Catherine (8). Rarely has there been a coach to accomplish so much and remain as humble as the winningest football coach in Kentucky high school history as Bob Schneider. He began his career with a bang in 1966 with an 8-2 record in the Greater Catholic League and being named GCL Coach of the Year. And this past season of legendary milestones has been a storybook year as well culminating in Newport Central Catholic's Kentucky Class A state championship with a 42-7 victory over Mayfield. The state title was the second for both Schneider and NCC, which last won a state football crown in 1984. In compiling a 13-2 record in 2005, Schneider ran his career record to 302-168-2. He moved into No. 1 on Kentucky's all-time list with 293 victories on September 17 with a 48-7 victory over Holy Cross; captured his 300th career victory with in 41-14 regional championship title over Lexington Christian; and on Dec. 3 nailed down his second state title. The 1955 graduate of Newport Central Catholic returned to teach at his alma mater in 1961 and went on to be an icon in the school's coaching annals. He has won numerous awards over the course of his 40-year career. He has been named Northern Kentucky Coach of the Year more than 10 times by the Northern Kentucky Football Coaches Association, the Kentucky Post or the Kentucky Enquirer. He was inducted into the Northern Kentucky Athletic Directors Hall of Fame in 1986, the Northern Kentucky Sports Hall of Fame in 1991, and the Newport Central Catholic Hall of Fame in 2002 and was given the National Football Foundation's Lifetime Achievement Award in 2003. For nine seasons, Bob coached both the football and baseball team. He compiled a 188-127 record as baseball coach and his teams reached the state's Final Four in both 1975 and 1976. 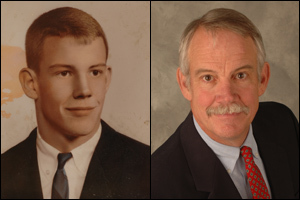 He was also Athletic Director for 35 years until 2001, and the school's assistant principal for 21 years until 2003. Schneider, who presently teaches English, is serving a four-year term on the Kentucky High School Athletic Association Board of Control. He lives in Newport with his wife, Nancy. They have four children – Laura, Steve Dave and Linda – and seven grandchildren.